When I hear of summertime and cards I instantly think of wedding cards. It's wedding season after all. In this Hero Arts Filigree Border Fancy Die is perfect for it. I used it on some pattern paper with glitter in light pink. I added two die cut borders and applied Grape Juice ink on die cut Congratulations die and two Memory Box butterflies. 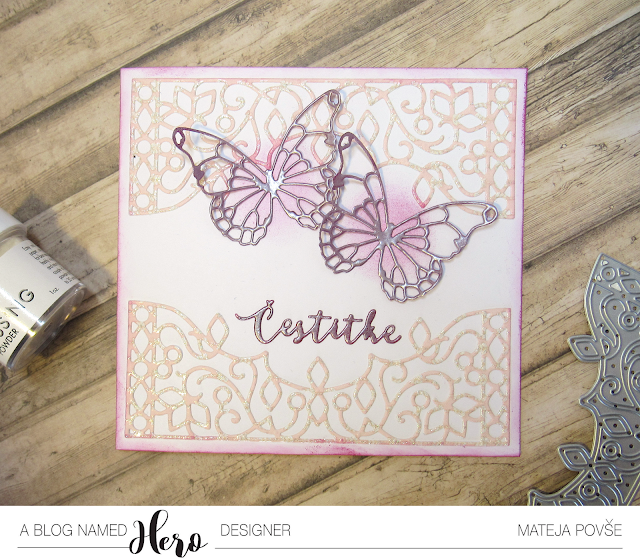 I also added Versa Mark ink on top and two coats of White Satin Embossing Powder. That is such a beautiful finish. Ko slišim besede poletna zabava, pomislim na poroko in s tem poročne voščilnice. Saj je navsezadnje sezona za poroke. 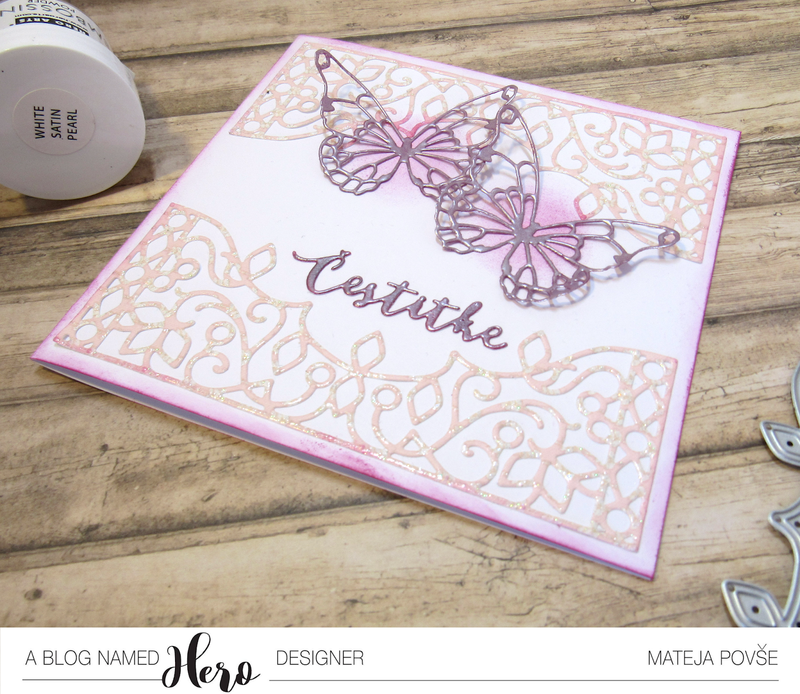 In Hero Arts Filigree Border Fancy Die rezalna šablona je kot naročena za to priložnost. Izrezala sem dva robova iz svetlo roza vzorčastega papirja z dodanimi bleščicami. Voščilo in oba metulja sem pobarvala z Grape Juice blazinico in s pomočjo Versa Mark blazinice nanesla še dve plasti White Satin embosirnega prahu. Res čudovit sijaj. There is Summertime Fun Challenge over at A Blog Named Hero and I can't wait to see how you interpret that in your creations. Thank you for coming over and have a great day! Na A Blog Named Hero je izziv Poletna zabava in komaj čakam, da vidim vašo interpretacijo in vaše kreacije. Hvala za obisk in želim vam čudovit dan!